Applications: Our superior quality FX ceramic top coated fibre disc is suitable for the most challenging applications where an outstanding rate of cut and excellent longevity are essential. For heavy stock removal, in a fast and effective manner the FX ceramic sanding discs will easily grind stainless steel and other hard metals. 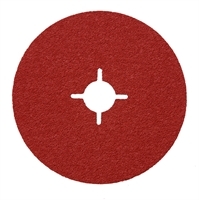 Product Notes: The FX discs are made from a 0.8mm backing and ceramic grit with top coating which contains grinding aids and additives which help to keep the discs cool in use. Also Available: Backing pads to suit fibre discs. Note: for best result always use the correct backing pad: a hard ventialted back up pad helps enable the FX discs stay cool whilst grinding.